This year, Thanksgiving brought in $2.9 billion and Black Friday brought in $5 billion. Until recently, Black Friday has been synonymous with TV reports of US shoppers shoulder-barging, screaming and pulling hair as they fight to lay their hands on heavily discounted clothing and electronics. But in 2017, Black Friday spread beyond borders, buying habits changed and sales figures reached new levels of dizziness. Black Friday is expanding to become a shopping period rather than a one day event. Across the globe retailers began offering deals on Black Friday that lasted all weekend through to Cyber Monday - the day dedicated to online shopping. In the US, the bargains are offered a day earlier with deals on the Thursday Thanksgiving holiday. Some even predict the shopping splurge will expand to occupy an entire month, changing from Black Friday to Black November. Secondly, Black Friday is increasingly becoming an online shopping event. The first to grab bargains are increasingly the quickest to click and swipe rather than the fastest to run and tussle in the shopping aisles. Here are five facts that tell the story of Black Friday (and Cyber Monday) in 2017. This, according to software company Adobe, was the combined online shopping spend in the US over Thanksgiving, Black Friday and Cyber Monday. While Thanksgiving brought in $2.9 billion and Black Friday brought in $5 billion, the star of online sales over the weekend was Cyber Monday. Online sales on Cyber Monday increased by 16.8% over last year to reach $6.6 billion in the US alone. The US-based trade body the National Retail Federation estimates that more than 174 million Americans shopped in stores and online from Thanksgiving through to Cyber Monday - 10 million more than 2016. However, those Americans who chose only to visit stores in search of a bargain are now in the minority. There were 6.8 million more Americans who preferred to solely go online in the hunt for deals. 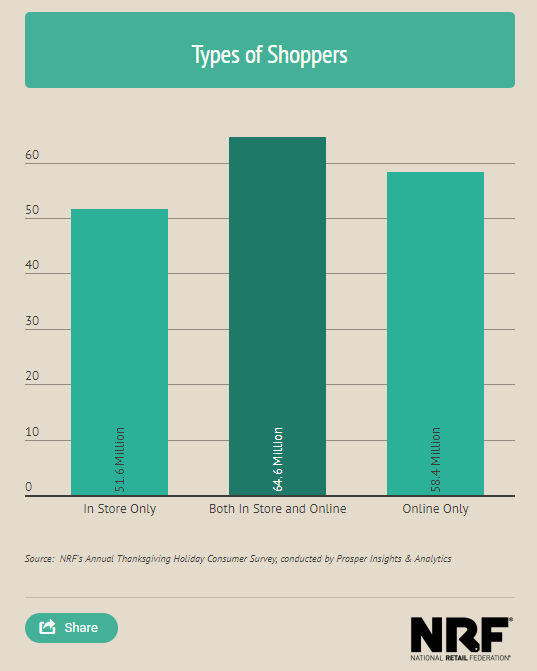 But the largest proportion of shoppers are now bargain hunting both in-store and online. The big driver for online shopping growth was increased mobile sales via smartphones and tablets. According to Adobe, mobiles accounted for 47.4% of all online shopping traffic in the US on Cyber Monday and one third of all sales revenues. Purchases made via smartphones were 39% higher than last year - a new record for online shopping growth. This year’s Black Friday confirmed that the shopping day has spread from the US to become a global phenomenon. Shoppers in the UK led the way outside the United States, spending an estimated £7.8 billion between Black Friday and Cyber Monday. That’s according to research for discount shopping site vouchercodes.co.uk carried out by the Centre for Retail Research. Other nations embracing the discount shopping weekend include Germany, which spent an estimated £5.7 billion online and in-store, and France with a £4.7 billion weekend spending spree. 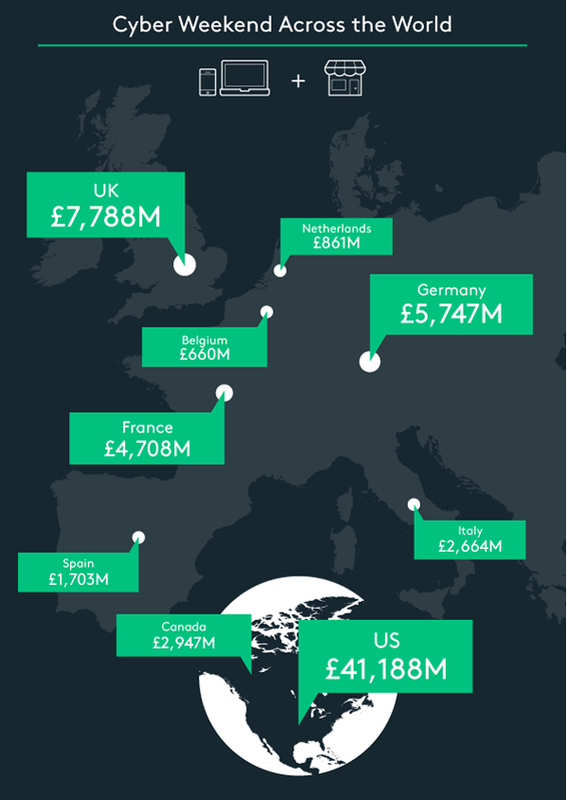 The UK also led the way in online spending, with £3.1 billion in cyber transactions over the weekend, according to the Centre for Retail Research. Canada experienced the biggest jump in online shopping over cyber weekend, up 18% from last year to £256 million. Black Friday’s short-lived title as biggest shopping day in the world is not only threatened by its extension to Cyber Monday and beyond. It is also dwarfed, in terms of online sales at least, by a day that happens earlier in November: Singles Day. This is China’s equivalent of Black Friday. Singles Day is a holiday that began as an anti-Valentine’s Day joke in a country with 200 million single people. The date of November 11th was chosen so that 11/11 could be the one-on-one-on-one-on-one day, when singles buy themselves a gift rather than waiting for the desultory stuffed toy or bouquet. During this year’s Singles Day, Chinese consumers spent $25 billion through the various online shopping outlets owned by ecommerce giant Alibaba. This one day of online shopping in China was more than the entire Cyber Weekend online spending of shoppers in the US, Canada and Europe combined.